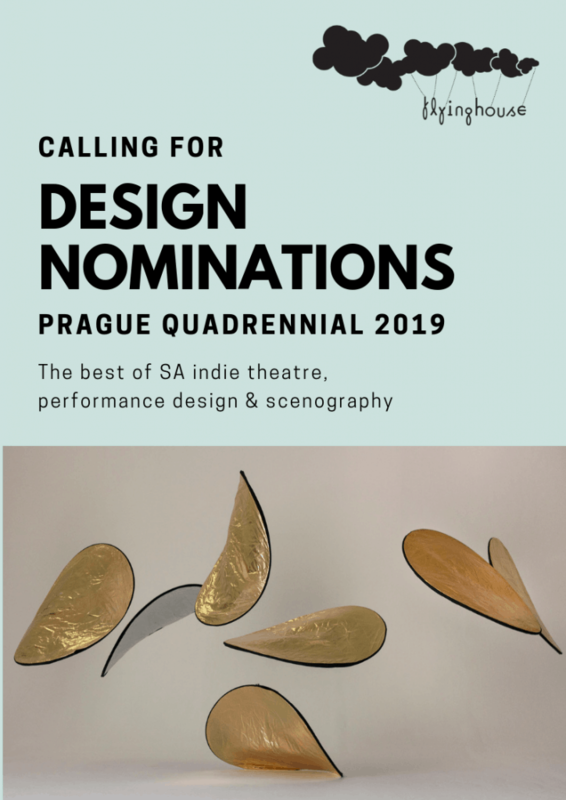 The Prague Quadrennial of Performance Design and Space is the largest scenography event in the world, held once every four years in Prague since 1967. Flying House is thrilled to announce that they have secured an exhibition spot at PQ in June 2019. Two curators, Jenni-lee Crewe and Tamara Schulz, will create an installation that showcases innovation from the world of SA indie performances. Outside of the mainstream theatre institutions and their big budget shows, designers, scenographers and theatre-makers are creating magic with minimal resources. Its time to show their work to the world. The exhibition aims to showcase the work of 10 designers for the international design community, and to activate sharing and discussion within our local community of independent designers and performance practitioners. Using the notion of reflection, deflection, framing, exposing and capturing, the curators imagine a shifting and transformation landscape – an installation comprised of the reflective panels that photographers use to enhance or modify lighting conditions. The metaphor this material offers is is that of reflecting and deflecting light in order to capture an image. In our daily encounter with ourselves, our others and our othered selves, we experience elusive moments of slippage where meaning flounders on predicated intent and imagined connection or missed connection. Did we say what we meant to say? Like photography, theatre design is about fixing fluid reality into an image in time and space, to impose a frame on multiple possibilities. What is reflected and what is deflected when the shutter snaps, when we make the choices we do for performance? How do we view each other, and how do those views act as filters, mirrors or windows? Do these reflections help us see better, or do they help us to look away? What types of spaces do we build around us? From gated communities to laagers, mine shafts to skyscrapers to temporary dwellings, the spaces we traverse say so much about who we are. Amazing examples of stage design & spatial innovation created despite financial or other challenges. Designers, animators, sound designers, choreographers – anyone working with space, scene and performance. Emerging, mid-career or established. Have to have created a work that fits criteria & must have hi-res pics and permission to use them in a high- end catalogue. Send your nomination, with contact details of the artist, to info@flyinghouse.co.za. We will give the artist a fuller brief & the materials to create their submission.